Ramy Ashour, the world number one from Egypt who last lost a match in the final of the 2012 Allam British Open Squash Championships in London, extended his unbeaten run into a second year when he beat compatriot Omar Mosaad in the first round of the 2013 championship, the fourth PSA World Series event of the year at the KC Stadium in Hull in the English county of Yorkshire. Top seed Ashour dominated from the off against world No10 Mosaad with some extremely precise hitting and deft foot work. Looking relaxed, the favourite was soon 3-0 up. Mosaad fought back but soon found himself one game down. In the second, Mosaad opened up a 6-1 lead. But 25-year-old Ashour refocused to take five points on the trot to draw level before moving on to stretch his lead to two games. Underdog Mosaad again showed his mettle in the third game, attacking strongly and taking the score to 6-3. But Ashour again fought back, this time displaying some moments of brilliance, to win eight points consecutively to close out the match 11-4, 11-9, 11-6 in 39 minutes. Speaking after extending his unbeaten Tour run to 37 matches, Ashour described the present season as his ‘hardest, but most successful’. Ashour will now face surprise opponent Chris Simpson, an English qualifier who pulled off the event’s first upset when he defeated Swiss number one Nicolas Mueller 7-11, 11-6, 11-9, 11-4 in 50 minutes. Mueller, the world No20, had the better of the opening exchanges but Simpson stepped it up in the second, hitting better length and width which secured the second game to draw level. The Guernsey-born 26-year-old fell behind in the third but came back strongly from 6-1 down to celebrate with a fist pump and win the game 11-9 to take a crucial 2/1 lead. There was no stopping the English underdog in the fourth as he confidently stormed through to take the match – and, for the first time in his career, book a place in the event’s second round. “I’m absolutely ecstatic,” said Simpson afterwards. “I was really up for it today as it’s the last tournament of the season for me. Local hero James Willstrop kept his hopes of securing a first British Open title alive after defeating South AfricanStephen Coppinger in a nail-biting first round match. The world number four from Harrogate in Yorkshire took 57 minutes to stop Coppinger 12-10, 11-8, 9-11, 12-10 as the two players traded points in the most exciting match of the tournament so far. Willstrop now joins fellow Yorkshireman and world number two Nick Matthew in the event’s second round. A delighted Willstrop described winning his first round match as a ‘very positive’ thing. “I came through it when he was making some very serious challenges – and that is positive. Willstrop is seeded to meet Ashour in the semi-final on Saturday in a repeat of last year’s epic encounter at the London O2 Arena. 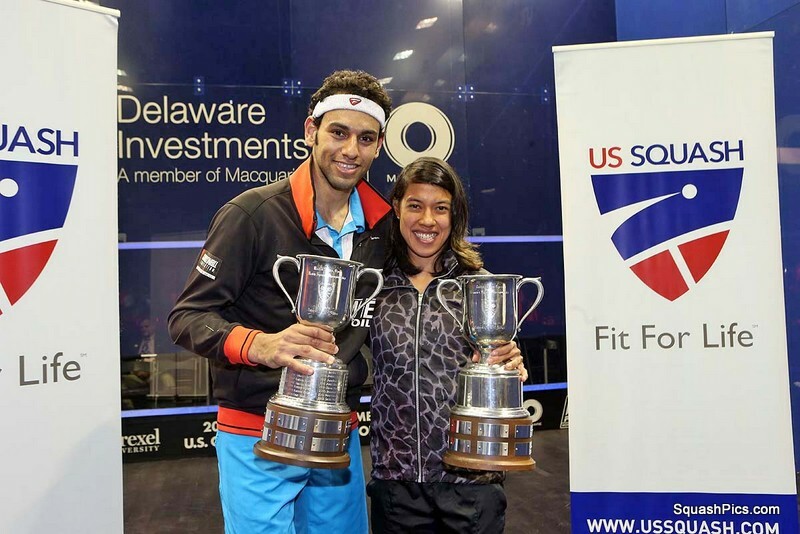 In rare twist of fate, Karim Abdel Gawad and Joe Lee ended up playing each other for the second time in the tournament after Englishman Lee was awarded a lucky loser spot after the qualifying finals. Unfortunately for the London-born 23-year-old, Lee could not avenge his earlier qualifying defeat to the Egyptian and went down by the same 3/1 scoreline. “It was a very close game and I was lucky to win today,” Gawad, the world No24 from Cairo, reflected afterwards. Australian Cameron Pilley was clearly fired up for his first round match against Ong Beng Hee – and proved to be too strong for the Malaysian with an 11-1, 11-8, 14-12 win. “I tried to stamp my authority on the match and focussed on getting a good length on the court,” said the top-ranked Australian. The first day of the Allam British Open main draw held a number of surprise results as the world’s elite battle for supremacy in squash’s oldest event. 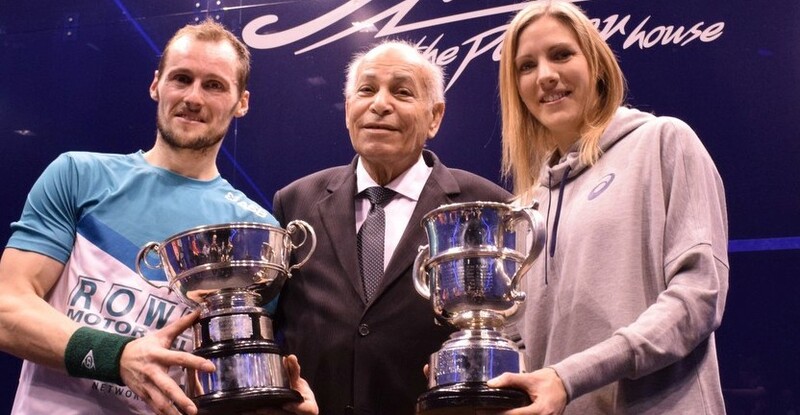 Unseeded English duo Sarah-Jane Perry and Sarah Kippax caused big upsets in front of a home crowd at the Pontefract Club in West Yorkshire, England, whilst Egyptian Nour El Tayeb also claimed an unfancied win. Having risen 42 places in the WSA World Tour rankings since this event last year, Sarah-Jane Perry has taken giant leaps in improving her game. This has been reflected in three WSA titles claimed so far in 2013, and the 23-year-old put in a performance of the highest quality to defeat No.7 seed Low Wee Wern. The powerful Englishwoman took a strong lead early on, whilst her Malaysian opponent was slow in rising to the occasion. A tiebreak second game showed signs of a struggle from Wee Wern and despite narrowly losing out 13-11, she returned to court to take the third game. Still acclimatising to the Tour as a Top20 player, the world No18 adjusted her game to combat the Malaysian’s fight-back, and held firm to deny Wee Wern a fourth game victory and record the best result of her career to date. Her first World Series second round appearance will be against No.12 seed Kasey Brown, following the Australian’s straight games dismissal of qualifier Lauren Briggs. Following Nour El Tayeb’s four-game defeat of No.9 seed Camille Serme, the Egyptian will have her eye on another scalp in round two as she faces eighth seed Jenny Duncalf. Duncalf will have other ideas however, after defeating Latasha Khan of the USA, and looking for her second career appearance in the British Open final, having finished runner-up in 2008. Qualifier Sarah Kippax also impressed home audiences with a marathon win against No.10 seed Natalie Grinham. Kippax lost out in a narrow opening game to the experienced Dutch international, but scrapped to an even closer 13-11 tiebreak win in the second. Back level, she set about taking the lead from the former world No.3 but after claiming a quicker third game, was pegged back in the fourth. Another determined effort from the 30-year-old Englishwoman however, saw the unseeded player progressing in 68-minutes to face world champion Nicol David in round two. David’s British Open title defence got off to the best of starts as the Malaysian beat Indian qualifier Joshana Chinappa in straight games. Her main threats to the title, second and third seeds Laura Massaro and Raneem El Weleily were also showing promising early form, with local Yorkshire-born Massaro defeating Joey Chan in straight games, whilst El Weleily of Egypt overcame qualifier Delia Arnold 3-1. Massaro will face Dipika Pallikal in round two, following the Indian international’s 75-minute marathon win over Line Hansen of Denmark, and El Weleily will play in-form Irishwoman Madeline Perry, who dispatched Emma Beddoes in straight games. Fourth and fifth seeds Alison Waters and Nour El Sherbini saw successes against their respective opponents in round one. 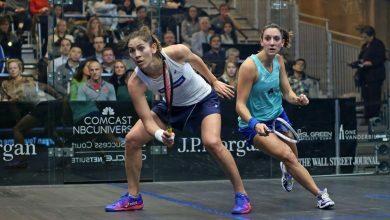 Waters of England came from a game down to defeat promising teenager and compatriot Emily Whitlock, while 17-year-old Sherbini took two tiebreak games to defeat Harvard student Amanda Sobhy 3-1. Waters will now face four-time British Open champion Rachael Grinham in round two, though the Australian won’t have too long to recover from her five-game battle with Nicolette Fernandes. Sherbini will face Egyptian compatriot Omneya Abdel Kawy following the No14 seed’s three-game win over Donna Urquhart. Sixth seed Joelle King was also comfortable on route through to the next round after beating qualifier Samantha Cornett of Canada. The Kiwi will play Annie Au of Hong Kong, following the No.13 seed’s 3-1 win over Aisling Blake. Winners of today’s round one matches will move to the KC Stadium in Hull for a televised schedule on SquashTV for the rest of the week. The $90,000 World Series event will hold round two split over Wednesday and Thursday with the quarter-finals on Friday, and the semis and final taking place on Saturday and Sunday.